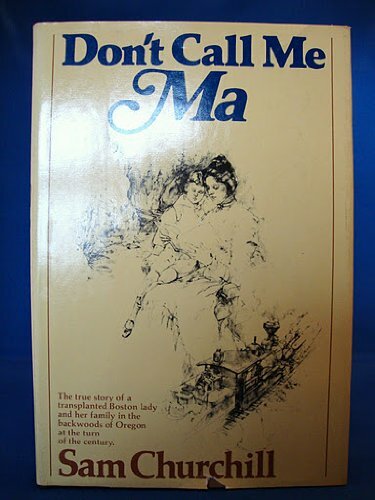 "Don't call me Ma" Sam Churchill's mother admonished, "Calves call their mothers 'Ma'" This is a true story of a transplanted Boston lady and her logger husband as they made a home in the Northwest woods. Sam Churchill grew up there, loving every minute of it. At this remote spot, the stars were the streetlights, and God was everywhere. Sam's memory makes it live again. Sam Churchill, born in 1911 at Astoria, Oregon. Lived in the logging camp about 20 miles from Astoria. He graduated from Seaside High School, attended Santa Ana junior college in California, then the University of Oregon. Served in the Navy in World War II, moved to the Yakima Valley in Washington. Wrote for the Yakima daily papers for 23 years. He wrote a popular column called Sam's Valley for the paper, wrote a book, Big Sam, published by Doubleday and Co., and magazine articles. Retired in l974, moved back to his favorite place, Astoria where he was close to the forest he loved. He married Dorothy Sheller in 1940,and had 3 children, Susan, Alan and Sam. Sam died in 1991 at age 80.